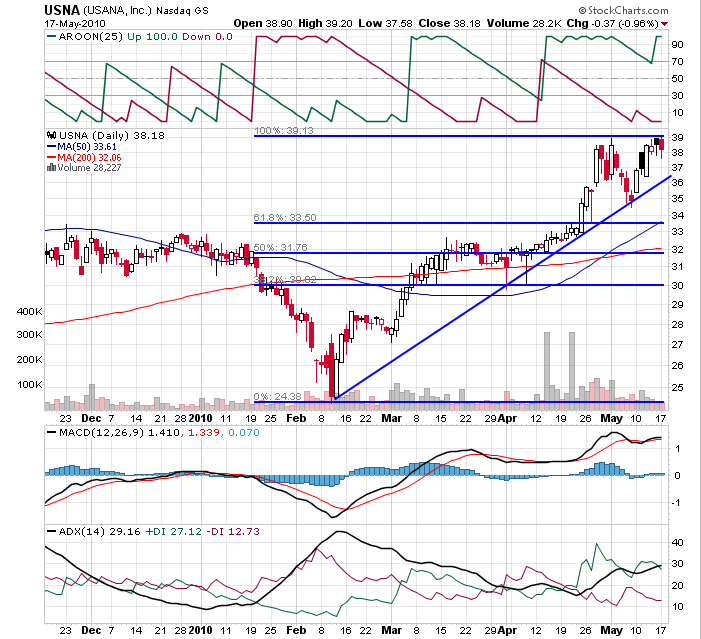 Every week or so I profile a few stocks that fall into the category of "reasonable value" and are showing strong charts. Today I'll submit just one stock, mostly because the recent downturn has played havoc with so many companies charts. 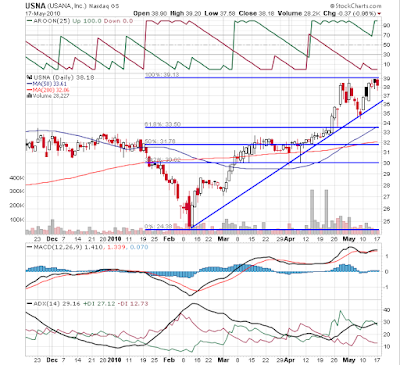 The stock in question is USANA Health Sciences (USNA). According to Yahoo!, here is what the company does: "USANA Health Sciences, Inc. engages in the development, manufacture, and sale of nutritional and personal care products in North America and the Asia Pacific. The company offers two product lines, USANA Nutritionals and Sense. The USANA Nutritionals product line consists of essentials, which include vitamins and mineral supplements. The Sense product line includes personal care products that support healthy skin and hair." So what we have is a very consumer-driven health care company. Not particularly unique in itself but the company seems to be doing very well. Even with the recent run-up in its stock, it doesn't seem to be over-priced. 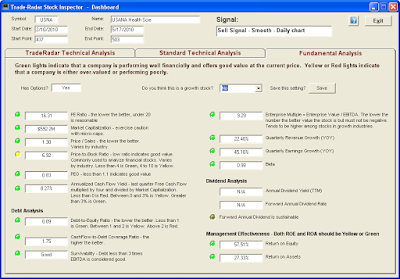 I'll illustrate what I mean by "reasonable value" by showing the Fundamental analysis tab from the new Trade-Radar Stock Inspector software. 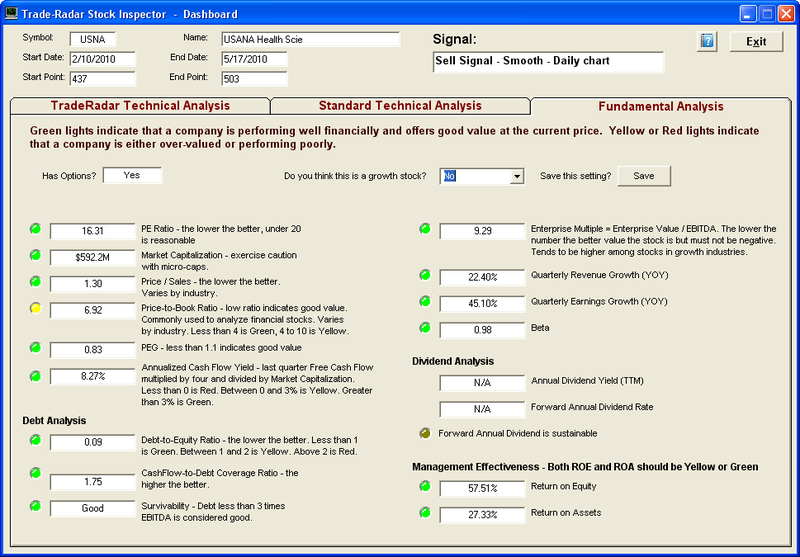 Just check it out - almost every indicator is green.Valuation indicators, debt analysis indicators, revenue and earnings growth and management effectiveness. The company seems to be running on all cylinders. You can see that the trending indicators, Aroon, MACD and DMI, are all reasonably bullish. You can also see that prices are bumping up against the topmost Fibonacci line. Could this indicate a buying opportunity coming up? If you're interested in seeing more about the Trade-Radar Stock Inspector software, visit the Features page.